Contrary to popular belief, it doesn’t take a team of stylists for celebrity moms to look their best. Take fashion cues from stars like Michelle Williams and Gwen Stefani, who have perfected their pick-up and drop-off uniforms effortlessly. The key is to throw on a few key pieces to transform your look. We've rounded up six star-approved items that will give you instant style status on the playground -- click to see them all. The perennial print sure has made its rounds in fashion history. Add a dash of retro charm to your look with a smattering of beloved dots. But follow Michelle Williams' example and pair it with tailored cigarette pants to bring it into modern-day territory. Top off your look with a two-toned tee. Feeling bold? Make one of the colors neon, like Jennifer Garner's. Add a pair of skinnies (distressed ones work, too) and lace-up booties for your newest go-to outfit. Rayon and spandex, $75; evesapple.com. A printed maxi dress requires little to no thinking. For the days when you don’t feel like coordinating, follow Heidi Klum's footsteps: Throw one on, step into comfortable sandals and you’re set for the day. A two-toned leather jacket can instantly elevate any outfit-just look at Sandra Bullock! Too cool and equally timeless, this bleached denim jacket with black leather sleeves is an investment piece worth the splurge. Cotton and lambskin, $385; shopbop.com. Bottoms up! Make like Gwen Stefani and find yourself some statement slacks. Scared of loud bottoms? 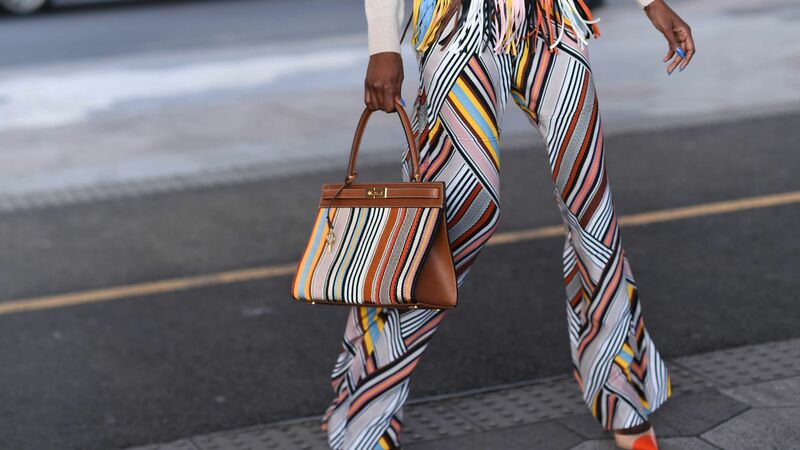 Start with Beetlejuice-esque pants with black-and-white vertical stripes. The neutral colors make it easier to style, and the long lines help lengthen legs. Then, find denim that gives a little stretch for extra comfort. Cotton, polyester, spandex, $154; bloomingdales.com. There's a reason that the LBD has been the mainstay of closets everywhere. As the universal secret sartorial weapon to easy dressing and looking good, it's no wonder Halle Berry chose it to pick up Nahla from school. Look for one with unique detailing, like scalloped edges, for an extra something.